In NUSSKNACKER (Nutcracker), the choreographer Antje Pfundtner looked at the most famous ballet of the 20th century: The Nutcracker. Its international popularity has sparked a wide range of stories about its origins, as well as different sources and interpretations. In the company of her eight dancers, the composer Sven Kacirek and a ‘chor de ballet’ (‘ballet choir’), Pfundtner dedicated herself to the images inherent in the most popular work in western dance history, and looked for correlations and contradictions in both individual and cultural memories. The project documentation (see above) shows how Antje Pfundtner and her company approached the myth of The Nutcracker in their rehearsal process: the dancers looked at historical photos of The Nutcracker in a workshop with the dance expert Isa Wortelkamp. The images were discussed, analysed and translated into short movement sequences. Working with the former soloist and current co-director of ballet at Theater Kiel Heather Jurgensen, who has a long history with The Nutcracker, the company also learned Louise’s variation from John Neumeier’s version of the ballet. Additional research into dealing the past as well as current visualisation methods was provided by the Tauschbörse der Erinnerungen (Memory Exchange), which was curated by the dramaturge Anne Kersting on 1 December 2012. The Exchange brought cultural theorists, historians, dance experts and other specialists together to discuss models of social, political and cultural remembrance practices and to test them out in various formats with the public. In the interview, Antje Pfundtner and her composer Sven Kacirek talk about the significance of Tchaikovsky’s ballet music, artistic research and working with historical material. How do you deal with a legend? In this interview Pfundtner and Kacirek explain their approaches toward The Nutcracker. The choreographer and dancer Antje Pfundtner trained at the Amsterdamse Hogeschool voor de Kunsten (Netherlands) in the Moderne Theaterdans department. Scholarships took her to New York and danceWEB Vienna. She managed the Sponsorship Fund of the Arts Foundation of North Rhine-Westphalia. She has lived in Hamburg since 2001 where she has developed most of her productions, including her solo eigenSinn, which was performed at Dance Platform Germany 2004. She has since produced numerous group and co-operative projects, including Outlanders (2006) with the Chinese choreographer Wen Hui from Living Dance Studio in Peking. She produced the solo TIM ACY as part of the international production collective O is not AcCompany. It was performed at Dance Platform Germany 2012.Alongside her own cultural work, she choreographs theatre and music productions, works as a coach for dance projects with young people (e.g. I like to move it move it, Linz09) and regularly teaches international workshops and seminars. Irmela Kästner in discussion with Heather Jurgensen and Antje Pfundtner about The Nutcracker. Antje Pfundtner likes fairy tales. And she loves Tchaikovsky’s music. The Hamburg-based choreographer and dancer has now undertaken a contemporary staging of the traditional ballet The Nutcracker and invited a former prima ballerina – the American Heather Jurgensen – to give a workshop to get her dancers in the mood. Jurgensen is well prepared thanks to Nutcrackerseasons at New York City Ballet. She later also danced the role of Louise in John Neumeier’s version of the Nutcracker at Hamburg Ballett, fulfilling her own personal dance dream in the process. The Nutcracker was also the first ballet that today’s vice-director at Ballett Kiel produced with her husband Yaroslav Ivanenko. And after a day’s workshop at Kampnagel, you might almost think that contemporary dance is rediscovering what ballet has already cast off. 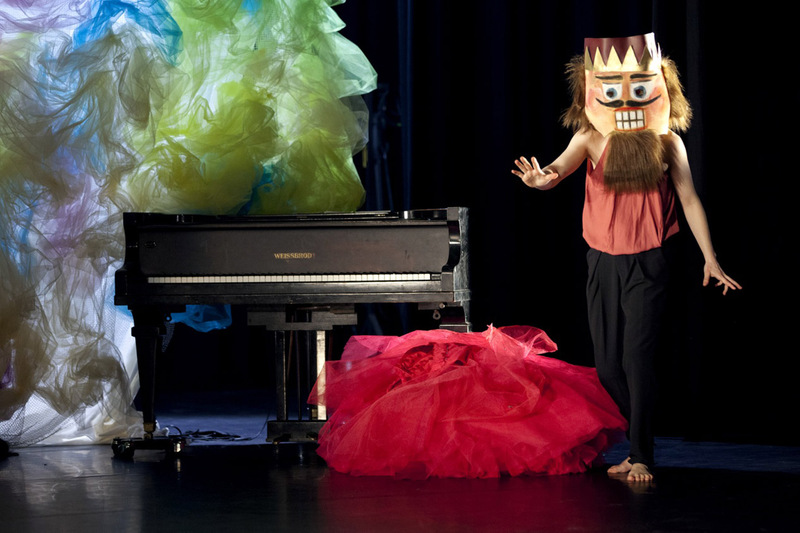 Heather Jurgensen, what connects you with The Nutcracker? Heather Jurgensen (HJ): As a dancer, you can’t avoid The Nutcracker. In my case, it has accompanied my entire career, from my first child performances onwards. Later, at the New York City Ballet, we performed Balanchine’s version of The Nutcracker for five weeks every season, eight performances a week. A magical spectacle, but I used to get mixed feelings from time to time. But ultimately the piece has a place in my personal history. Antje Pfundtner, when did you get to know The Nutcracker? Antje Pfundtner (AP): I also learned ballet as a child. My teacher wrote a few fairy tales of her own and used music from The Nutcracker for them, hence my love for this music. The Nutcracker is also one of those works that are etched in cultural memory. Even if you have nothing to with dance, you think you know The Nutcracker from somewhere. For me, it’s a placeholder, a type of springboard, as it includes many tings that move me in my work. I am particularly interested in dealing with music, how to work with dances, and the fairy tale element. How did you come to invite Heather Jurgensen to give a workshop? AP: I wanted to invited someone from this world, who had a career in it and who loved their career. I also learned ballet as a child, and in my dance you will recognise therelevant movement vocabulary. And you shouldn’t disown stories that have inscribed themselves in the body. But I could never teach it. Louise’s variation, which you, Heather, brought to the workshop, is a very difficult classical dance variation. John Neumeier created it for a ballerina and out of respect for Marius Petipa’s purism. Why did you choose this variation in particular? HJ: Antje asked me to bring something that is part of me, that is related to my experience. For me, the role of Louise isThe Nutcracker. I danced it for 13 years. It is in me. Did you have any concern about it being too much for a group of contemporary dancers? HJ: I didn’t think about the men initially, and was then worried that it wouldn’t be any fun for them. The variation is very feminine and is normally danced on pointe shoes. But they gave their all. HJ: Yes, that they weren’t inhibited in any way. AP: When we watched the original material, my dancers responded completely randomlyand only watched the dance. I liked that. What idea sparked the workshop – the rubbing togetherof the different physical challenges of classical and contemporary dance in order to extract a dance piece? AP: The direction I gave my dancers was to give themselves to whatever Heather was offering, but at the same time to reflect on their own histories. I told them to ask themselves the question: where is that caught up in my body? And that they should follow up this friction so that the dance didn’t remain a façade or was only a fleeting piece of fun for a day. HJ: I think dancers are dancers, regardless of whether they are from ballet or another tradition. The feeling in the ballet studio is always the same. There is a great sense of openness. I came into this room and was pleased to meet such interesting people. I was very curious about how the dancers would take to the material. This “role that is part of me” is a very typical attribution in ballet. How does it sit with the fact of passing on? AP: Heather and I were talking about the importance of particular teachers in our very first meeting. The ballet teacher who shaped me most, Patricia Kapp, died last year. I had already included her in the research. She was wholly enthusiastic about my idea and had sent me her book on Petipa. And Heather told me immediately about how inspirational her own teacher Violette Verdy had been for her. The person who shapes you melts into the memory of your own repertoire. However, in contemporary dance training, dance icons are generally less influentialaestheticallythan a school or a particular choreographer. HJ: Violette Verdy taught us every day at New York City Ballet – for me an exceptionally generous, enthusiastic personality, and intelligent with it! I knew that she had inspired John Neumeier for the role of Louise. It was the only time I asked John if I could dance a particular role. How much freedom is there when slipping into a pre-existing role – or vice versa: how much pressure is there to copy? AP: When conducting my research at the German Dance Archives in Cologne, I saw in film sequences how the great ballerinas pass on their roles to younger ballerinas, and they often did so at a time when they couldn’t even move well themselves any more, which is something I found very amusing. So the dance was only conveyed in words, a few gestures and hints. That is an interesting “overwrite”, so in ballet there is no overall image to copy. The young ballerinas can always add something of themselves. HJ: In my experience, the dance always moves slightly away from the actual choreography. Now and again we looked at the choreologist’s book, but we always had a certain amount of freedom in our interpretation. AP: Up until yesterday, my dancers thought Heather was also one of these old ballerinas, because of the massive career she already has behind her. I had to remind them that classical dancers start much younger. That is an important difference for me, and it determined my approach. What is the particular appeal of The Nutcracker? Indeed you, Heather, have only recently staged it with your husband Yaroslav in Kiel. HJ: It was also the director Daniel Karasek’s wish, as he believed there hadn’t been any real classical ballet in Kiel for such a long time. So we decided to produce The Nutcracker as a piece for the family. The result was two great hours of dance and entertainment. E.T.A. Hoffmann’s story is narrated, although in our version Klara is a girl at boarding school and the Mouse King rules in the cellar. I think our staging is quite the opposite of what Antje has in mind. AP: It is a type of analysis in process. I hope people will seequality in this is analysis. I’m creating the childhood references from autobiographical material, which is something I often do. As I say, for me The Nutcracker is a springboard, even in terms of the music. Sven Kacirek has acquired the entire score, but even this outcome will be something individual rather than “Kacirek goes Tchaikovsky”. But I’m still afraid that people will be disappointed because they want to see Klara’s story. It seems, however, that mice will be performing, as there are mouse tails already hanging on hooks over there. AP: I often rehearse with props that overstate an expression but form no part of the final piece. We also work with characters, but the theme is then how we handle a character, not the character itself. But it’sstill something different for me to be searching for the path into my own work by rubbing the template. The result will be an overwrite, not another version of The Nutcracker. And no interpretation. The name remains, however, as any description would destroy the character of the piece. What is appealing about working with figures? HJ: As a dancer, I have always loved shaping a role, becoming someone and making it credible, and at the same time following a plot, narrating a story. In this workshopI was interested in going about it more freely, improvising, setting an exchange in motion and not just showing the steps. I also include traditional ballet gestures. I have prepared and researched them specially. AP: I wanted to work in this direction. I talk a lot in gestures myself, so we have already worked on developing a character via gestures. Is Klara’s story still important at all then? HJ: In the traditional version of The Nutcracker, there needs to be a reason for dancing two actsand Klara is the link. The plot is actually dealt with in the first act, but then it really gets going, with the divertissements, the different dances. This is when the journey really begins, when things really get colourful. AP: My dancers want to dance two acts. It’s a big wish of theirs, but I’m not yet sure myself. For me, theglass of sparkling wine in the interval and all the magic of the evening are part of ballet. Anyway, a second act could provide me with the legitimacy for starting all over again, and that is a thoroughly appealing option. Irmela Kästner (Hamburg), author and dance critic. 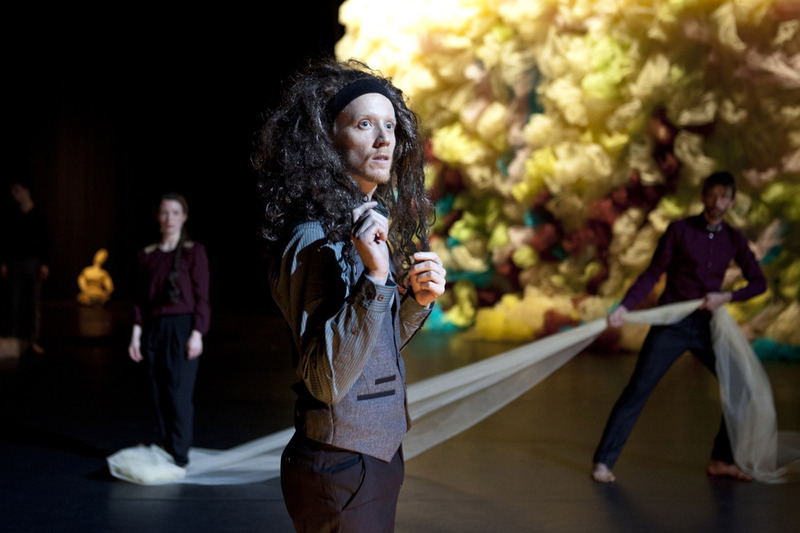 As part of the premiere of Nussknacker on 12 December 2012, the dance company Antje Pfundtner in Company investigated the body’s wealth of memories and looked at the choreographic scope afforded by visualisations of a traditional work as well as the appropriation of stage design. In order to expand their research into current visualisation methods, the company organised a Tauschbörse der Erinnerungen (Memory Exchange), which went way beyond dance and brought experts together for an interdisciplinary discussion on contemporary remembrance functions and strategies. 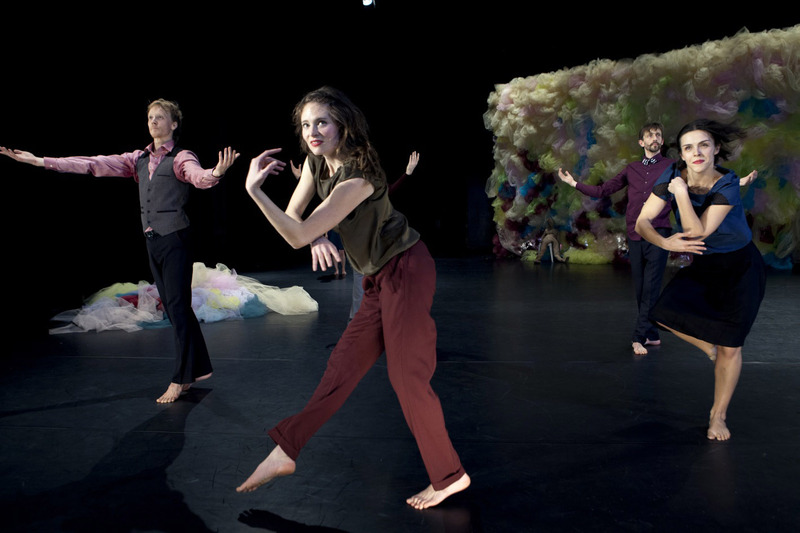 In Pfundtner’s previous work VERTANZT, an on-stage dialogue about the incompatibility of memories led into a 12-minute dance duet that leapt with great agility over the insistent memories of both dancers. From the unachievable consensus between the statement “She must have done it roughly like this” and the answer “I remember it differently” emerged a joint choreography whose dynamic caused every insistence on correct remembrance to be forgotten in the here and now of the movement. First the memory of a staging, in order to attain the symposium’s core themes: how do we move between the past, the present and future prognoses? And how can we rest on our memories if our own here and now often escapes? Remembrance is becoming increasingly popular as a theme in the widely expanded debate of our relationship with history. The call for a remembrance culture is growing, and with it an unavoidable discussion about the memory space in which we act. As contemporary witnesses of the Second World War die out, a form of cultural memory is replacing individual and direct remembrance. At the same time, generations are growing that see themselves as confronted with the requirements and consequences of modernisation. The deep, disorientating incision of globalisation, climate change and financial crisis is fostering a longing for recollection and nostalgia. Which form of orientation does the present require in order to create a basis for present and future action? What role does remembrance play in this? The Memory Exchange brought together cultural theorists, historians, dance experts and other specialists to discuss models of social, political and cultural remembrance practices and to test them out in various formats with the public. How are we called upon to remember? Who gets the mandate? Where do we go with mechanisms and idealisation? Where are memories filed? And what part of it is our heritage? Additional guest performances are planned. A production by Antje Pfundtner in Gesellschaft and DepArtment, co-produced by Kampnagel Hamburg and FFT Düsseldorf. Funded by: TANZFONDS ERBE – an initiative of the Kulturstiftung des Bundes(EN: German Federal Cultural Foundation), the Cultural Authority of theFree and Hanseatic City of Hamburg, the Kunststiftung NRW (EN: Arts Foundation of North Rhine-Westphalia) and theHamburg Cultural Foundation.